Va-va-va-VOOM! 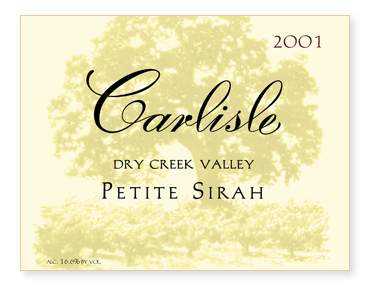 Feels great to be offering a Petite Sirah again, especially one so "Carlilian" in nature! The fruit for this wine was sourced from two wonderful vineyards in Dry Creek Valley, the Del Carlo Ranch and the Unti Ranch. While not old vines, they were cropped at very low yields to ensure plenty of ripeness and flavor. Picked on October 7th, the must was cold soaked for 5 days before inoculation with a yeast strain known for contributing to smooth mouthfeel. Once fermentation was complete, the wine was left to macerate on the skins for several more weeks, another technique for enhancing mouthfeel. After a total of 40 days on the skins, the wine was pressed into a mix of new and used French and American oak. It was bottled unfined and unfiltered in January 2003.